The Hakkoryu Martial Arts Federation was founded by Dennis Palumbo in 1974, for the initial purpose of promoting the teachings of Hakkoryu Jujutsu and Shotokan Karate. Over the years, the HMAF grew to include registered schools and members around the world. Many of Palumbo Shihan's training friends went on to found similar organizations within their own arts. 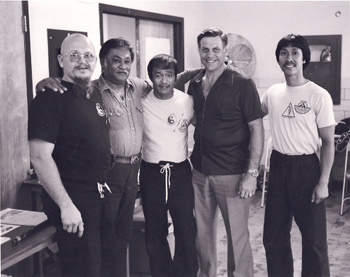 The photo includes, from left: Fred Degerberg, Ramon Lono Ancho, Dan Inosanto, Dennis Palumbo, and Manuel Taningco. Palumbo Shihan respectfully retired from the Hombu Dojo in 1998. In an effort to continue passing the teachings of Shodai Soke Okuyama Ryohu and abide by the wishes of the Hombu Dojo, he created the system Hakko Densho Ryu Jujutsu and converted The Hakkoryu Martial Arts Federation to The Hakko Densho Ryu Martial Arts Federation. The meaning of Hakko Densho Ryu is the art of Hakkoryu taught as Palumbo Shihan was taught, the technique passed down in the traditional manner, by word of mouth. Hakkosen means “Eighth Ray of Light”. The Hakkosen Dojo of Denver, Colorado, owned and operated by Palumbo Shihan, was open continuously for 30+ years. In 2006, Shihan Palumbo decided to retire from active teaching, close the Hakkosen Dojo, and teach his senior students privately. In 2008 Palumbo Shihan turned over the active administration of HMAF to his student, Dara Masi. He named Dara Masi as Director of HMAF and gave her the responsibility for all teaching, ranking, and administration of HMAF. Upon Palumbo Shihan's death in 2014, Masi Shihan became the head of Hakko Densho Ryu Jujutsu. Masi Shihan is honored to continue her teacher's work. She travels extensively teaching classes and is known for her precise, detail based and open instruction. She enjoys working with martial artists of all styles and invites you to experience the beauty and efficiency of Hakko Densho Ryu Jujutsu.